Joe Braden, state auditor’s office representative, presents Englewood’s Director of Finance Della Stearns with the Auditor of State Award. 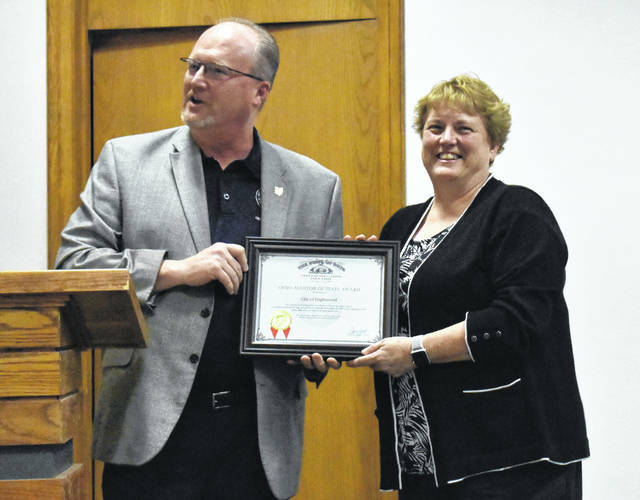 ENGLEWOOD — Director of Finance Della Stearns received an award from the office of Auditor of State Dave Yost at Tuesday’s council meeting. Presenting the award was Auditor of State Representative Joe Braden. “This award represents the hard work of all of the city employees here in the city of Englewood who strives each day to achieve accounting excellence,” Braden said. He also said he wanted to recognize city council, the mayor, city manager and everyone that have done an excellent job in accounting for all the dollars here in the city offices and in all the departments.